How warm have recent temperatures been? 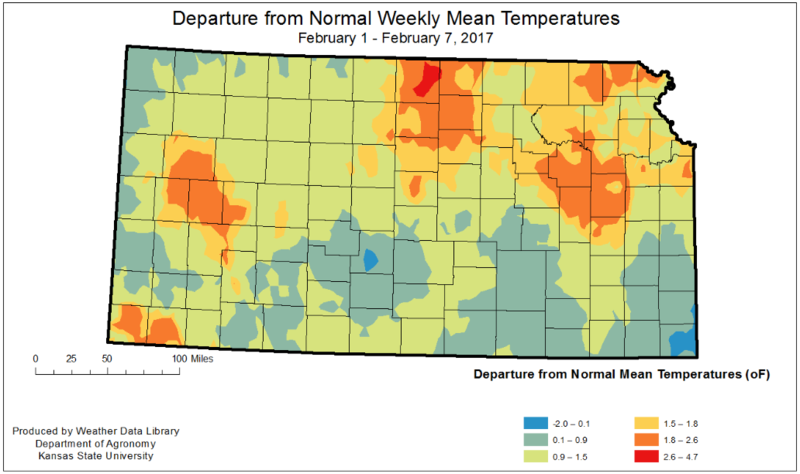 Since January 24th, the majority of the state of Kansas have experienced warmer than average air temperatures for this time of the year. 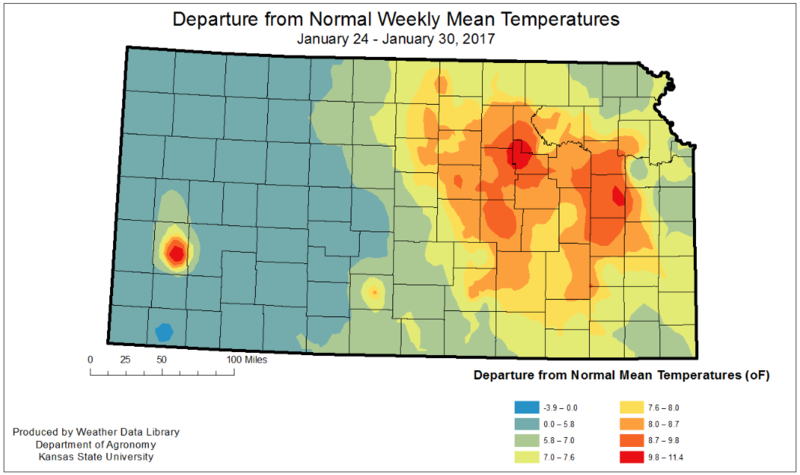 During the week of January 24-30th, the eastern half of the state had temperatures departing from the normal in as much as 11 degrees Fahrenheit (Figure 1). The week of 1-7 February was cooler than the previous week, but still warmer than the normal in as much as 4.7 degrees Fahrenheit (Figure 1). The forecast indicates that temperatures will also be above normal for the period of February 10-12. The effects of these warmer-than-usual temperatures to the wheat crop are concerning producers and crop consultants. The physiology of wheat vernalization and cold hardiness suggests that soil temperatures at the crown level rather than air temperatures should be the primary driver leading to increased or decreased cold hardiness during the winter. Soil temperatures will be influenced by the amount of residue in the soil surface as well as soil moisture. Soils that sustain a thick residue layer often hold lower temperatures than bare soils, as the residue block direct exposure to sunlight and reducers soil evaporation, generally conserving more moisture. Moist soils require more energy to change in temperature than dry soils; thus, the increase or decrease in temperature occurs slower than in dry soils. Therefore, moist soils with heavy residue will heat more slowly than dry bare soils. Soil temperatures at 2” depth across the state of Kansas ranged from less than 32°F in the northcentral portion of the state, to as high as 41°F in the approximate southeast quarter of the state (Figure 2). The greatest soil temperatures were measured in the southern 3 tiers of counties, east from Comanche/Kiowa/Edwards counties (Figure 2). 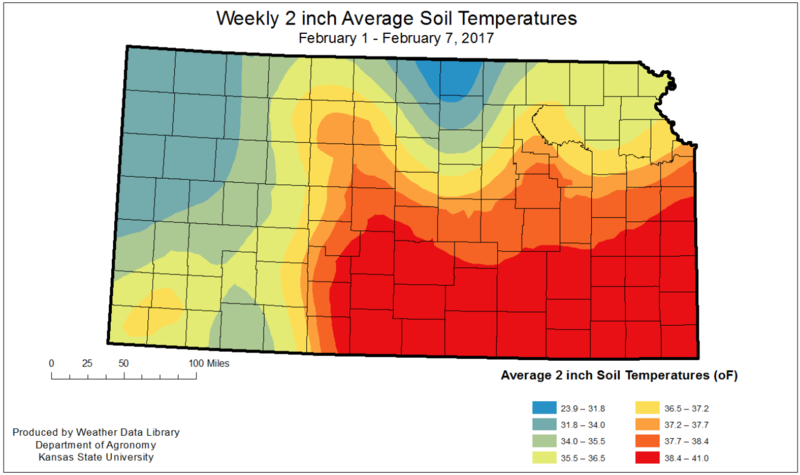 Weekly 2” average soil temperatures across the state of Kansas during the 1-7 February period. Although average temperatures did not seem to come close to the 48°F threshold for winter wheat to start losing cold hardiness, daily soil temperatures were actually approached very close to this threshold, and sometimes even surpassed it at several portions of the state (Figure 3). Particularly, locations such as Parsons, Hutchinson, Stevens, Harper, and even Hill City, were consistently near the 48°F threshold (Figure 3). Soil temperature at the 2” depth during the 1/1/2017 to 2/8/2017 period. Cold hardiness is not a static state. After the cold hardening process begins in the fall, wheat plants can rapidly un-harden when soil temperatures at the depth of the crown get above 50 degrees. But the plants will re-harden as crown temperatures cool below 50 degrees again. By the time winter begins, winter wheat will normally have reached its maximum level of cold hardiness. Wheat in Kansas normally has its maximum level of winter hardiness from mid-December to mid-January, unless there are high temperatures during that period. The effect of the high soil temperatures measured in the late-January early-February period on the wheat crop will depend on several factors, but will particularly depend on the temperatures during the remaining of February and early March. In locations where temperatures were consistently close to 50°F and with little fluctuation during the recent period, such as many regions within the southeast quarter of the state, the high temperatures should cause a gradual loss of cold hardiness. The warmer the crown temperature got during this recent period, the more quickly the plants will start losing their maximum level of cold hardiness. The forecast indicates that temperatures should decrease to low forties across the state in the week to follow, which would be beneficial to the crop and possibly help hold crop development back. Winter wheat can re-harden during the winter if it loses its full level of winter hardiness, but will not regain its maximum level of winter hardiness. Thus, in this regions the crop will be less tolerant to low temperatures, becoming more exposed to freeze injury if temperatures decrease to single digits in the near future. While some producers expressed the concern with a possible spring greenup, it is very unlikely that even varieties characterized by short vernalization requirements will go into spring greenup at this time. The vegetative condition map (figure 4) shows only a slight increase in photosynthetic activity compared to average. Vegetative conditions for Late-Jan/Early-Feb 2017 compared to average.